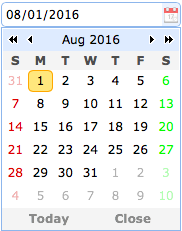 The datebox combines a editable text box with drop-down calendar panel that allows the user to select a date. The entered string in the text box can be transformed to a valid date. The selected date can also be formatted as expected. The properties extend from combo, below is the added properties for datebox. buttons array The buttons underneath the calendar. Available since version 1.3.5.
sharedCalendar string,selector The shared calendar used by multiple datebox components. Available since version 1.3.5.
formatter function A function to format the date, the function take a 'date' parameter and return a string value. The example below shows how to override the default formatter function. parser function A function to parse a date string, the function take a 'date' string and return a date value. The example below shows how to override the default parser function. onSelect date Fires when user select a date. The methods extend from combo, below is the overridden methods for datebox. calendar none Get the calendar object. The example below shows how to get the calendar object and then recreate it. setValue value Set the datebox value. cloneFrom from Clone the datebox from a source datebox. Available since version 1.4.1.